1. I’ve been writing like a fiend. I’ve completed my second novel, entitled (rather lamely,) The Empress’ Assassin. I don’t know if it’s any good. 2. I’ve missed writing on this blog more than I can say. Especially lately. Now that November is over, I’m back for good. Since I don’t have a current work-in-progress, I’m going to spend all my writing time on publishing stuff here. 3. I still – STILL! – don’t know whether or not my college will allow me back in the upcoming semester. I’m truly disappointed with the way they’ve handled the whole situation. If it weren’t for the fact that Sarah Lawrence College has incredible teachers and an amazing set of intelligent students, I would seriously consider trying to get into one of the many other schools that accepted me. Can you tell that I’m resentful? Hmph. 4. Sadly, I won’t reach my goal of reading 144 books in a year. I’m only on book #116 now, and it’s December 1st already. Still, for the first year ever I’ve kept a reading list, which I’ll publish on December 31st. 5. I’m vacuuming all the books in my house. Yes, I know, this is insane, but they’re all incredibly dusty and the shelves ought to be cleaned properly. I’ve started in my room, and have rediscovered scores of old children’s books. I found my beautiful illustrated Cinderella and Snow-White, all my lovely Patricia Polacco books, my Dr. Seuss and Charles Schulz… I could go on endlessly. 6. I just finished rereading A Little Princess, one of my favorite books ever. Strangely, I started reading Vanity Fair today and found curious similarities. Then again, as my wonderful mother pointed out, private boarding schools were the popular and proper education in England for quite a long period of time, so maybe it’s not so odd. 7. I actually have nothing further to say right now, so in lieu of actual information, this seventh item on my silly list will simply bid you all a lovely Wednesday! Your second novel! You go, girl! You like just finished the first! WQW, you are an inspiration! Thanks, Suzi ^_^. It’s a first draft, of course! But yes, I really rushed this one because it was for National Novel Writing Month (aka, Nanowrimo) so I outlined it in October, and then wrote it in November. What’s the deal with SL? That’s annoying. And congrats on finishing your second book! Woot! * HUGS * Glad you’re back, dahling! I’m not sure what to address first. Welcome back. Just the other day I thought “where is she?” I’m glad to know things are fine and you’re okay. Way to go on the novel. What an accomplishment. That’s also a very high amount of books to read in a year. I’ve never counted. Maybe that should be my new years resolution. You still have all your childhood books? I think that’s the neatest thing ever. How I wish I had mine. I know I have a lot of my boys books and I’ve given a few of them to their children quite recently. I didn’t want to give them to them too early as I didn’t want the ruined at this late stage. What’s up with SL?? That bothers the crap out of me. Take care. It’s so good to see you back here. Thanks Joy, I’m glad to be back as well! 1. Congratulations! That is awesome! 3. Unnnnng, aren’t colleges the most aggravating places ever? Well. Not *ever*. But it seems like everyone (myself included) has so many problems with the administration side of things. 4. I was trying to read 200 (like I did last year — well, including picture books =p). Fail. I didn’t anticipate life getting in the way, ha ha. 7. I hope you're having a wonderful day! WOW, 200! I count picture books too, though :). Yay…I’m glad you’re back. 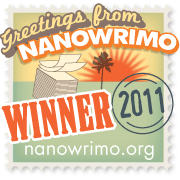 Congrats on finishing NaNoWriMo! A Little Princess is one of my all-time favorites as well. Also Love the older movie version with Shirley Temple. Wow, I didn’t know Shirley Temple played Sara Crewe! Interesting. I should try to get hold of that sometime!